Published on 14 September 2008. The Summer Books series, which has hopefully kept both sjhoward.co.uk and Gazette Live readers entertained over the last three months, was an idea conceived back in June to stave off a summer of desperate, straw-clutching silly-season posts about random topics. I think it’s worked rather well. But it’s also revealed some interesting things about my sjhoward.co.uk readers. For example, the most popular of the reviewed books from the point of view of orders placed through sjhoward.co.uk/shop has been Never Push When it Says Pull: Small Rules for Little Problems by Guy Browning. 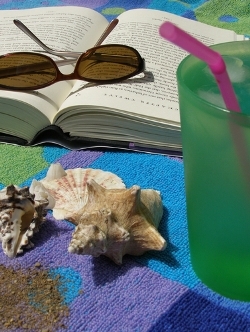 That single book has outsold its nearest Summer Books rival by a factor of almost ten-to-one, which certainly surprised me, considering the relative national best-sellers that have also featured. So why should this be? Is it because people hadn’t previously heard of Never Push… and liked the sound of it, whereas they’d already read many of the others? Is it because many of my readers are Guardian fans, and have previously enjoyed Browning’s columns? Or is it because Never Push… was the only downright good fun book I reviewed? Whatever it was, I’d like to thank everyone that’s supported the site by buying the reviewed books (and others!) through sjhoward.co.uk/shop. From the point of view of funding the site, the series has been a remarkable success, with profits from sales of the featured books actually outstripping the sjhoward.co.uk advertising revenue for the summer. So thanks for your support over the summer – I hope you enjoyed the series, and I hope you’ll stick around and continue to read sjhoward.co.uk into the autumn and beyond. This 1,370th post was filed under: Summer Books, Books, Gazette Columns, Guy Browning, Introspection.